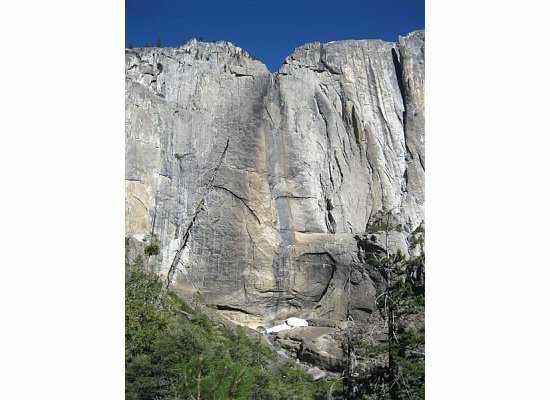 Since I began hiking in Yosemite National Park, I have steered clear of the Upper Yosemite Falls trail. I feared it. 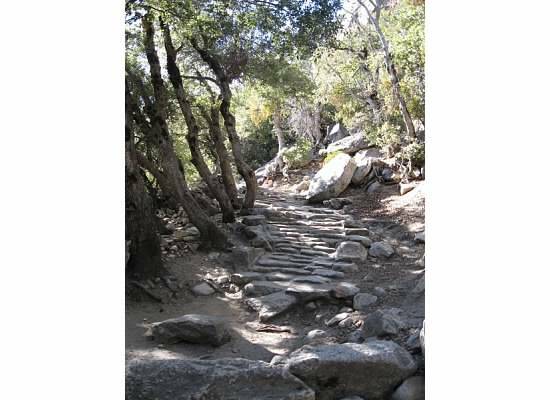 In my mind it was an extremely hard trail to traverse, crowded and unpleasantly hot. It’s amazing how our minds can blow things out of proportion. In reality, there was nothing to fear. 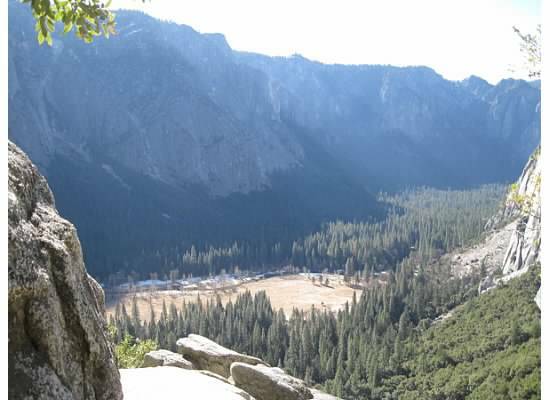 Mid-morning, Mary Elizabeth and I headed out on the trail that climbs 2700 feet to the top of Yosemite Falls. The sky above was such a bright blue “happy sky”, I thought as I gazed upward. The air was still, the weather great for hiking: in the low 30’s when we began then rising to the low 60’s by afternoon. Unusual for January. We took our time climbing up the rocky steps. 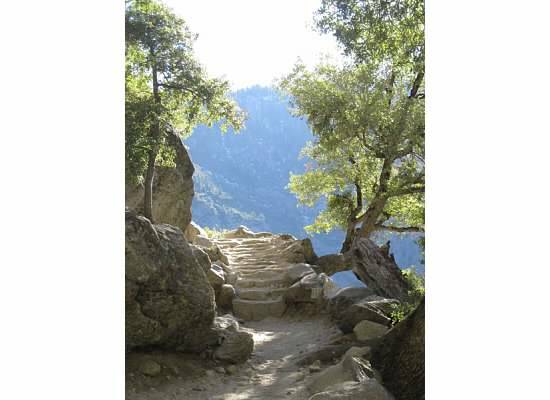 We walked under fragrant California Laurel trees, and around steep switchbacks that offered amazing views of the valley below. We paused at Columbia Point, elevation 5036. Columbia Point with Half Dome in the background. We met many people along the way: a group of six men and women from New Zealand dressed in shorts and tank tops; a man from China touring the United States who warned us that the trail was slippery up ahead; and a couple with loaded backpacks walking a 24-mile loop during the holiday weekend. 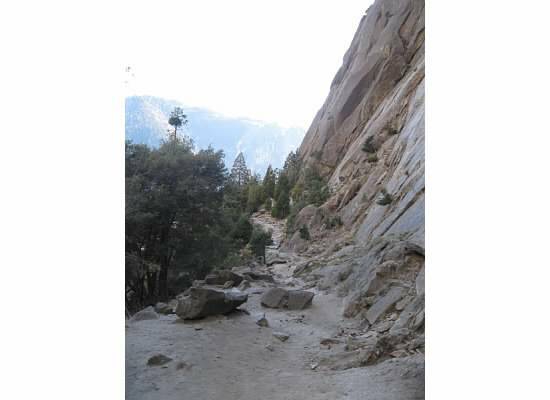 A flat section of trail where spray from the fall can be felt when there is ample water. We caught our first glimpse of the upper fall from a flat section of trail. It appeared that the fall was dry save for a trickle. Our first look from the trail at the quite dry fall. 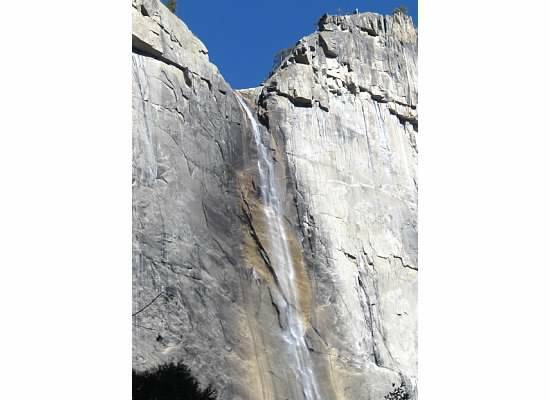 Notice the white snow near the base of the fall. It appeared that we could make our way easily to the fall from our lunch spot, but we still had over a mile and another thousand feet to climb to reach the top. We were satisfied with what we had accomplished for the day, and after the brief respite headed back to the car. Looking down at the valley below while heading back. 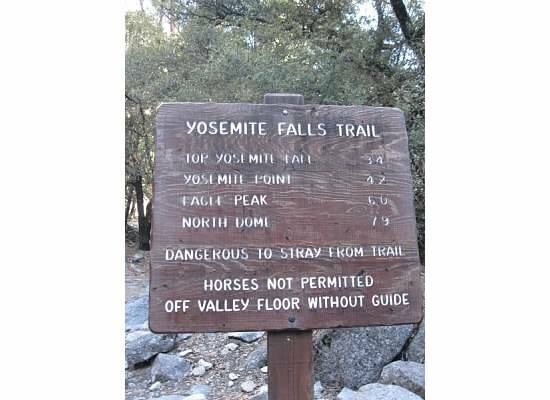 In retrospect, there was nothing to fear in hiking the Upper Yosemite Falls Trail. Thanks to our mild winter the trail was comfortable and a much easier climb than I had anticipated, however, we didn’t make it to the top. 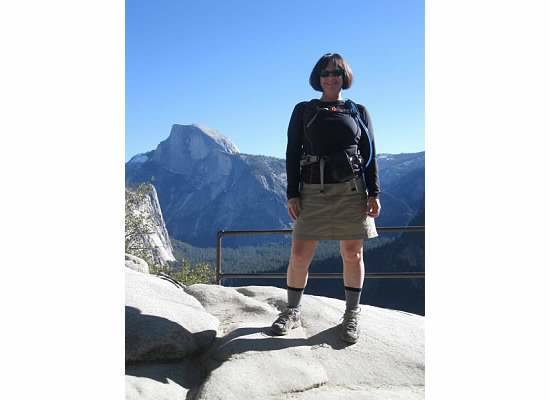 This entry was posted in Yosemite Hikes and tagged Columbia Point, Hiking, Upper Yosemite Falls Trail, Yosemite, Yosemite Falls, Yosemite National Park on January 19, 2014 by Janet. That third picture, the one of the switchback, looks like you were walking on the edge of the earth. Beautiful pictures and I’m glad you were finally able to make that hike. Yes, our minds can certainly blow things out of proportion and create fear when none should exist. However, perhaps caution is a good thing. I have a question. Have you always lived in this area? Hi Kathy, We’ve lived in the foothills for a little over seven years now. That is such a great hike, though it does get really busy in the summertime. Good call going now when it’s quiet. It’s so exhilarating to physically challenge yourself and then be rewarded by the amazing views in the Valley! Hello! 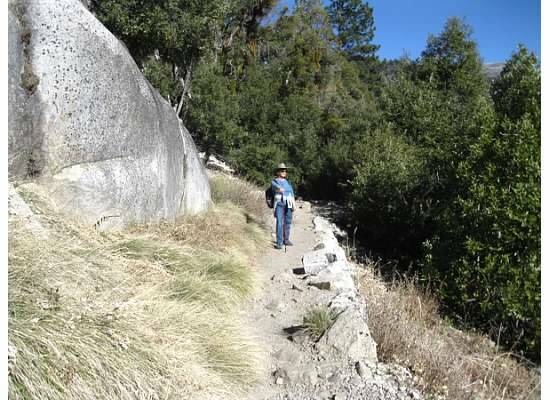 I found your blog while searching for the Sierra Hiking Seniors group. My dad recently moved to the Oakhurst area and does several hikes in the park and surrounding areas per week. Can you tell me how I might put him in contact with this group, or other active seniors?